This photograph shows visitors on the Council Grounds sometime in the 1880's or early 90's. 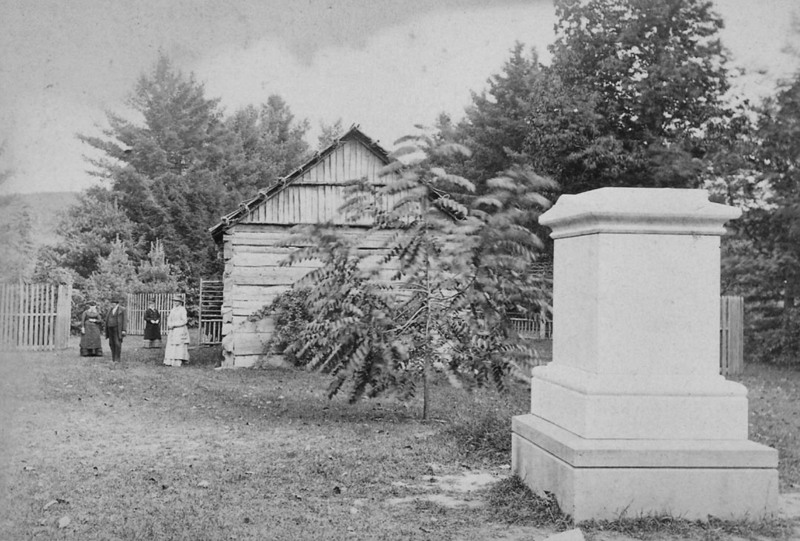 The monument on the right is the "new" gravestone that Mr. Letchworth placed on the grave of Mary Jemison - it later became the base of the famous statue. The tree behind it was planted by one of her grandsons. Beyond the tree is the Caneadea Council House. This view is of special interest because few images show the Council Ground from this angle. For other views of the Council Grounds, go to the photo index. For many years it was impossible to re-enact this photograph. After Mr. Letchworth's death in 1910 the Council Grounds underwent several changes - including the moving of the Council House away from the grave. Recently, as part of the Park's Centennial Celebration, a restoration project was undertaken which brought the Council Ground back its original Council Ground location. See Image 154 for a similar view. Special thanks to our friend Karen Gibson Strang for sharing this remarkable photograph with us!